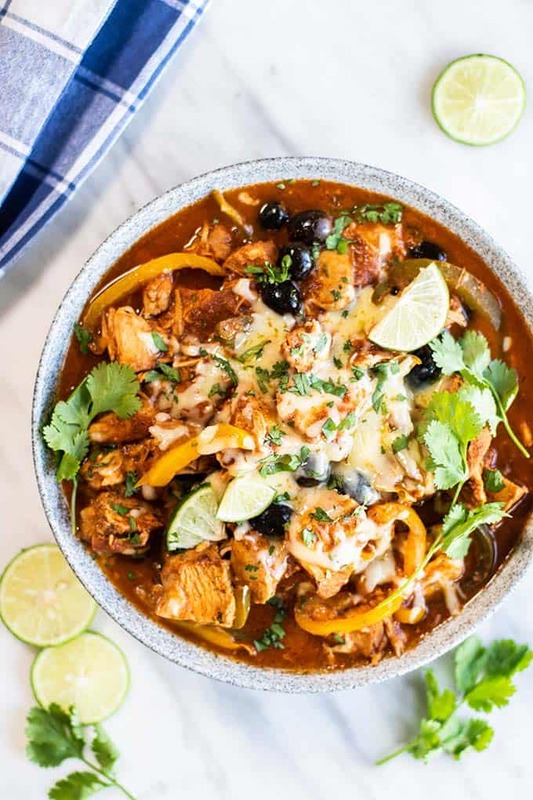 This delicious Crockpot Enchilada Chicken combines tender chunks of chicken with tangy enchilada sauce. Serve this over rice, on lettuce wraps, or over a sweet potato for a complete meal. 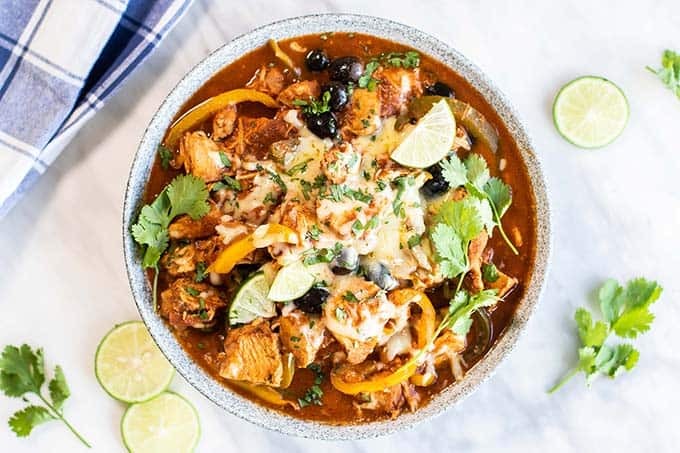 This crockpot chicken recipe is sure to be a hit! I love chicken cooked in the slow cooker. It’s easy to prepare, and the chicken becomes so tender and full of the flavors of whatever sauce is used. Since I recently began getting back in to meal prep, I’ve been making a big crockpot dish once a week. Like with this recipe, I make enough for dinner, plus to pack away several more lunches or dinners (occasionally I’ll eat something like this for breakfast, too!). Protein is definitely the most difficult thing to incorporate into my diet during busy weeks. It’s easy to make a salad or cook a quick pot of quinoa, but taking the time to make chicken when I am running around and barely have time to stop to eat at all just doesn’t happen. When I am meal prepping, I want to make sure whatever I am packing is still going to taste as good as it did on Day 1 on Day 4. Not such an easy task! Especially with proteins, that dry out. This chicken meets that requirement (and goes beyond, because it’s freezer friendly, too!). To ensure the chicken doesn’t dry out while slow cooking, I leave the breasts whole. When I am ready to add my veggies (I like to do this the last 45 minutes-1 hour, so they don’t get soggy), I pull the breasts out and chop them into chunks. More area to soak up the delicious sauce! This recipe is based off my homemade enchilada sauce — but no need to go through the process of making that recipe. This is simplified (but still super delicious). Just whisk some tomato paste into some chicken or vegetable broth along with a couple of spices, and pour into the crockpot along with the browned chicken breasts. Really short on time? Skip the browning step! Really, it’s not that big of a difference. Tastes better (believe me here, my friends!). Takes literally minutes, and is free from preservatives, GMO starches and thickeners, and is much lower in sodium. This chicken is so good, you’ll find yourself stealing pieces of chicken from the crockpot! But, alas, you must serve this to your family as well. Whole30 Style: Omit the cheese! Serve it over cauliflower rice. Classic Family Style: Cook a pot of quinoa or whole grain rice, and serve this over the top. Stuffed Sweet Potatoes: The spicy sauce pairs so well with creamy baked sweet potatoes! Bake some spud and load ’em up. 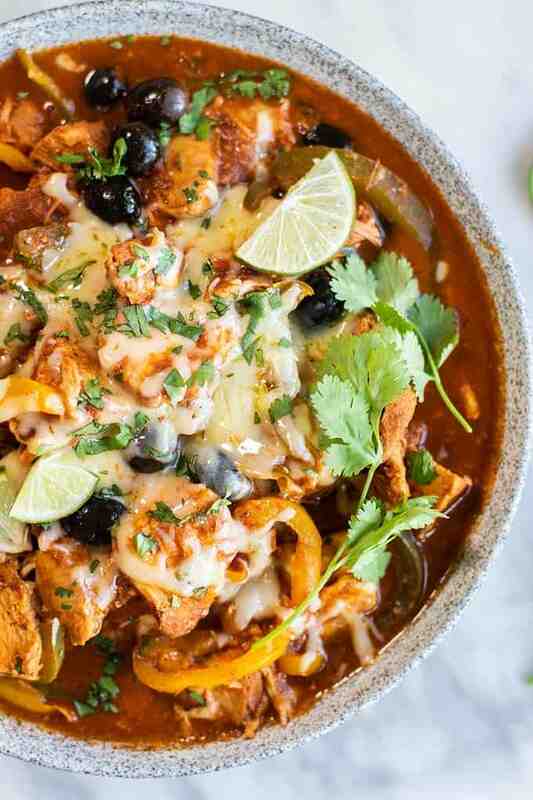 Tender chunks of chicken slow cooked in a spicy and tangy homemade enchilada sauce. I like to add peppers and olives (always add more veggies! ), but keep it basic if you prefer your veggies on the side. Heat a skillet over high heat, and add olive oil and chicken breasts. Season with salt and pepper, and brown both sides of each chicken breast. 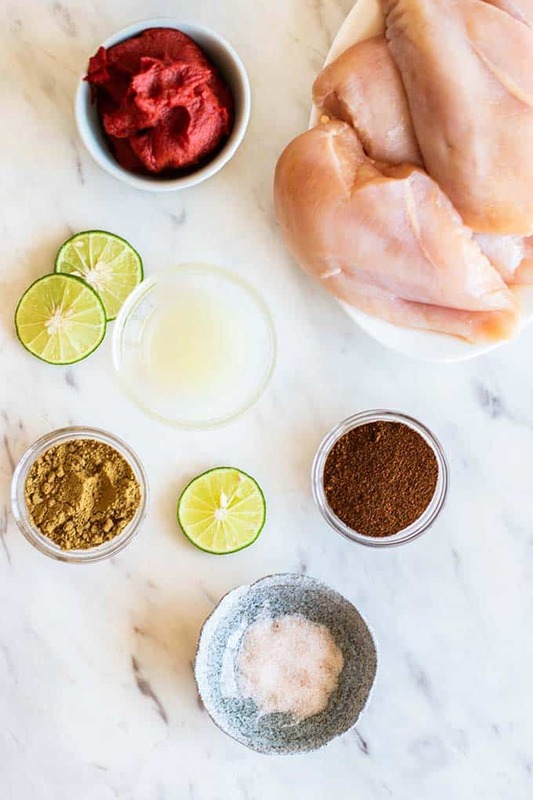 Add chicken breasts into slow cooker. In a bowl, add broth, tomato paste, spices and lime juice. Whisk until the mixture is smooth. Pour the enchilada sauce over the chicken. Slow cook on low for 3 hours, or on high for 1 1/2 hours. Add bell peppers, olives, and top with cheese, and then continue to cook for another hour on low, or 1/2 hour on high. 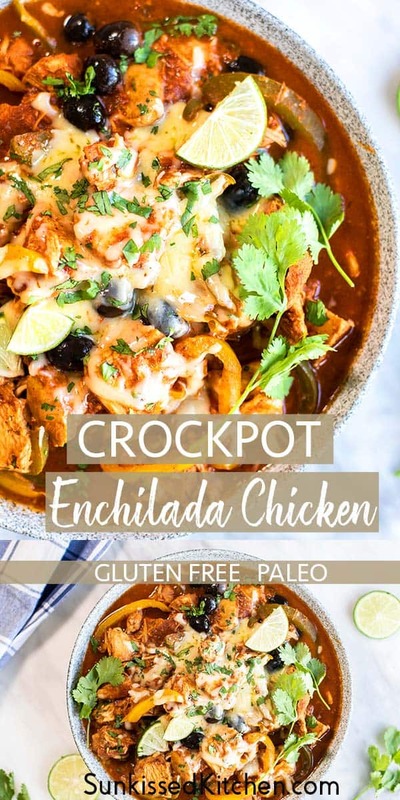 This Crockpot Enchilada Chicken post contains affiliate links, meaning if you make a purchase, I will receive part of the sale as a commission. This helps me continue to bring you lots of fresh and inspired recipes! This Bowl is such an amazing and delicious meal full of flavors. My family to relish it. Yum! 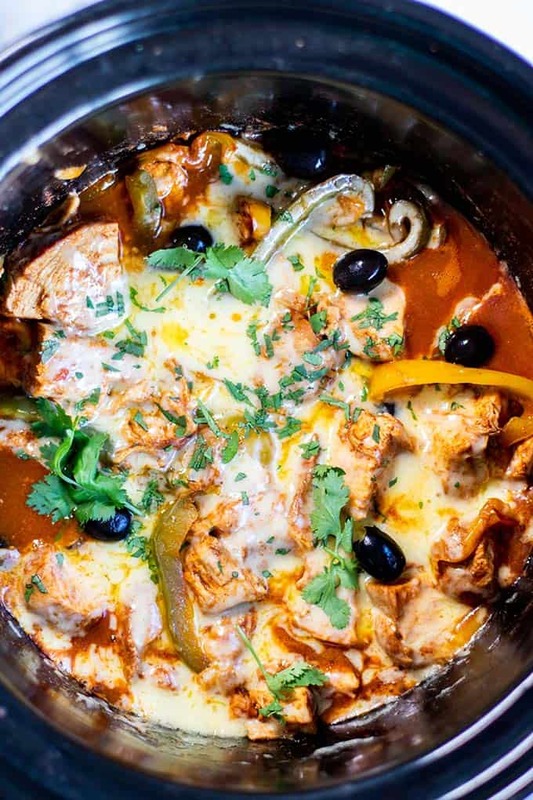 Love anything I can make in my slow cooker and this looks so full of flavour and delicious!! I've really got into using my crockpot this year and I'm always looking for new ideas. Thanks for the recipe. Oh my does this look super delicious! my family is going to love this. Yum -- I'm all about that cheesy topping! 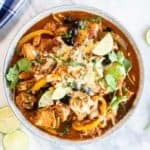 This is such a great recipe, and I love how easy the slow cooker makes it. Thanks for sharing!